I had the great honor of being asked to appear on Geek & Sundry’s Starter Kit show. My role? Run a six-session introductory session of Numenera for a group that’s never played the game before and teach them all the ins and outs. And of course, in so doing, teach the viewers as well. I didn’t know what to expect when I showed up at the Geek & Sundry studios. What I found was a busy place of dozens and dozens of professionals in the television and movie industry putting together more programming than I was even aware of, and yet everyone was extraordinarily friendly and welcoming. This was a place that brought in newbies and guests like myself all the time and knew how to treat them well. Once miked up and in the studio, I was amazed at the gorgeous set they put together specifically for Numenera. Floating obelisks and weird constructs surrounded us. The table was covered in crystals that could very well be fantastically advanced machines. I also got to see the titular “starter kits” themselves—wonderful engraved boxes containing dice, notebooks, a dice tray, and more for each player, including a nameplate for their character. 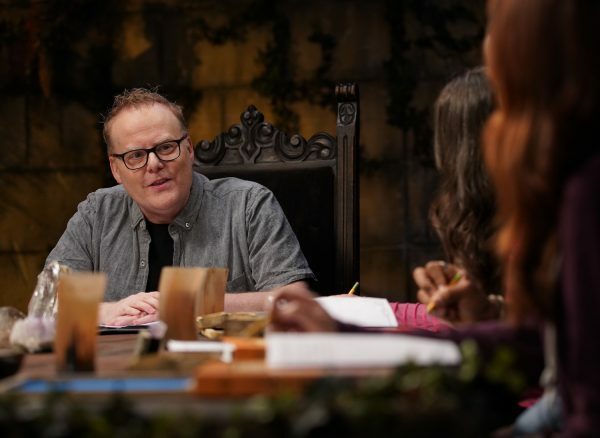 The first episode is character creation, but because it was a number of one-on-one scenes with the players, it took by far the longest. The other episodes are more or less just straight playthroughs of the game. We specifically designed the flow of the game events so that I would first introduce task resolution, then combat, then resting and recovery. 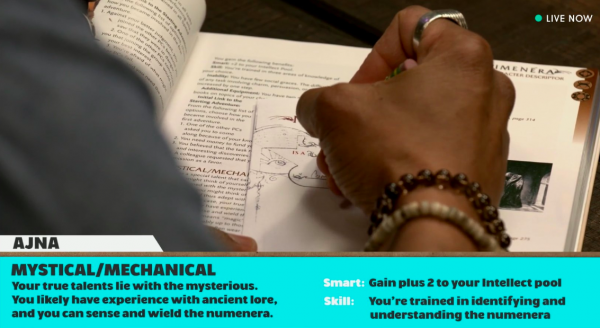 I examined all the Cypher System mechanics and made sure each one got presented so viewers really do learn the whole game. Fortunately, it’s not a complex system. Everything, from simple task resolution to NPC interaction to combat all works the same. Although planned out (as you would with a typical campaign), the game’s not scripted. I didn’t always know what the players would do and that’s always the best part of the game for me. I love to be surprised by people’s creativity and this group certainly did not disappoint. The finished show is incredible to watch. The production quality alone is amazing, but the show is fast-moving and well-edited with fantastic graphics showing game stats and artwork so you can easily follow along both in the story and in learning the game. Starter Kit is a huge endeavor involving lots of people. I’d specifically like to thank Writer/Producer David Nett; Producer Chris Fishel; Production Coordinator Clifford Breakfield; Director Frederick Snyder; and of course the players: Jason Charles Miller (creator of Starter Kit), Tara Platt, Jeremy Walker, Nicole Villela, and Erika Fermina. And as long as I’m on a roll, let me also thank the rest of the crew and people responsible for the show: Executive Producers Jason Corey, Andy Shapiro, and Sean Becker; Producer T.J. Rotell; Production Assistants Morgan Coleman, Mela Hudson, and Mike Flores; Director of Photography C. J. Brion; Camera Operators Christiaan Tahyar and Andrew Harris; 1st AC Alex Herzog; BTS Joshua Thomas; sound mixer Erik D. Magnus; hair and makeup artists Ada Trinh and Diana Knudsen; art department members Brad Baily, Emily Gawronski, Jordan Cinnamon, John Adams, Darrel Hobbs, Angie Lister, and David Wallace; and electric department members Anthony Roldan, Mike Swiatek, Brody Culbertson, Eli Just, Zach Kienitz, Dan Anson, Zach Zeidman, and Jerimiah Magan. 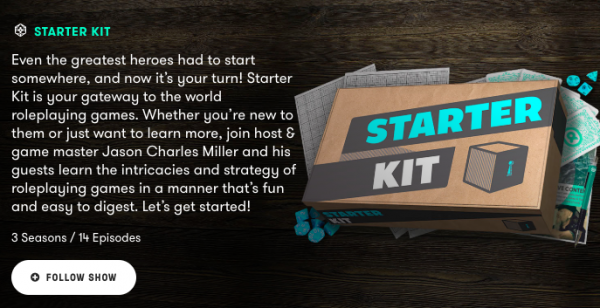 Starter Kit is showing on Geek & Sundry’s Project Alpha channel, found on their website here. You can get a free two-month trial if you sign up and use the code NUMENERA when you do. It’s absolutely worth checking out even if you already know how to play Numenera. 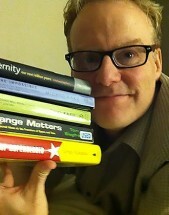 And if you don’t, well, learn from the guy who wrote the game on Starter Kit. on Thursdays at 5:30 p.m. PDT! This entry was posted in Articles & News, Game Better and tagged Numenera, streaming, video.